The United Methodist Church’s top legislative body will meet at the Oregon Convention Center, the largest convention center in the Pacific Northwest, on May 10-20, 2016. Click here to read the May 23 edition of the South Georgia Advocate. A Note from Bishop King on the adopted plan, "A New Way Forward"
The Council of Bishops will be meeting the Saturday after General Conference. We will release a statement for clarity and direction regarding the naming of a special commission to bring recommendations back to General Conference on disciplinary paragraphs related to human sexuality. There have been no changes in The Book of Discipline around human sexuality. Please be prayerfully patient. 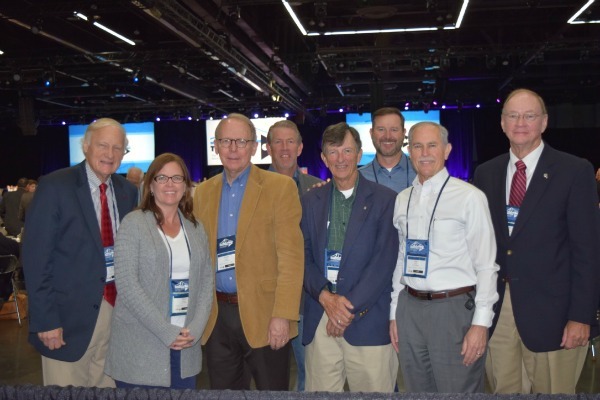 The 2016 South Georgia Conference Delegation to General Conference. From L to R: Mr. Bill Hatcher, Mrs. Allison Lindsey, Rev. Don Adams, Rev. Jay Hanson, Mr. Carl Childs, Rev. Jim Cowart, Dr. Bob Moon, and Mr. Larry Price. Social Media Follow the hashtags #UMCGC and #GC2016 as the conversation continues. The Daily Christian Advocate (DCA) is the official journal of the General Conference of The United Methodist Church. It serves as the record of those who have been elected to serve as delegate, the legislation submitted, and the decisions made by the General Conference. See the Advance Daily Christian Advocate, which contains all of the legislation submitted for consideration by the delegates.